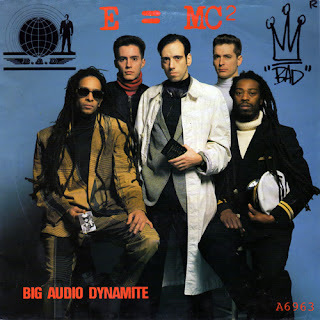 Big Audio Dynamite (later known as Big Audio Dynamite II and Big Audio, and often abbreviated BAD) are a British musical group formed in 1984 by the ex-guitarist and singer of The Clash, Mick Jones. The group is noted for their effective mixture of varied musical styles, incorporating elements of punk rock, dance music, hip hop, reggae, and funk. BAD's one constant throughout frequent shifts in membership and musical direction are the vocals provided by Mick Jones. After releasing a number of well-received albums and touring extensively throughout the 1980s and 1990s, Big Audio Dynamite disbanded in 1997, but have announced a reunion as of January 2011. "E=MC2" is a song written by Mick Jones, the guitarist and singer of The Clash and performed by his post-Clash band Big Audio Dynamite. It was included as the third track on their 1985 debut album This Is Big Audio Dynamite. The track is considered to be the first song to make use of highly defined sampling technologies. E=MC2 missed out on becoming a top ten hit in the UK, where it peaked at #11 and #37 in the U.S. dance chart becoming the band's most well-known song.